After graduating from the University of Georgia with a degree in landscape architecture, Erik immediately began developing his track record as a designer. His successful approach to design has benefited several companies in the southeast. Beyond design, his skill set includes project management, job costing, knowledge of the horticultural market, plant installation techniques, hardscape materials and construction methods, proposal development and contract negotiation. 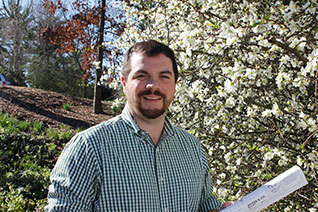 At UGA’s College of Environment and Design, Erik mastered several computer-assisted drawing programs including the industry standard AutoCad. His proficiency in CAD facilitates collaborations with general contractors on large scale commercial projects; sharing digital files across the web allows us to increase our productivity and our range. Erik employs three-dimensional rendering software to accurately depict how conceptual designs will appear once installed. His drawings allow our designers, crews, subcontractors and especially our clients to visualize how hardscape elements like shade structures, fireplaces, fountains will enhance their landscape projects. An artist, Erik creates attractive and accurate illustrations to convey his design intentions, express his visions and engage his clients, knowing that a drawing coming to life helps to build confidence and longevity in relationships- characteristics valued by the Fockele Garden Company. Erik, his wife Aimee, and three young children live on a section of their family farm- the homestead tract has been in the family for four generations and includes the home where his grandfather was born. In his spare time, Erik enjoys raising his kids, vegetable gardening and art.